College canteen is the most vibrant and exciting place in the college. It becomes furthermore exciting when a trusted name like Dabur runs an event there. It was an event to launch the new fresh and tangy flavors of Hajmola; the trusted digestive tablet from decades! Hajmola is an excellent combination of the traditional Indian herbs that have been found immensely useful in correcting the digestive disorders. With the market share of 50 percent in the segment, it is the undisputed leader. The objective of digital outdoor advertising is to associate the Generation Next with the product and to establish the habit of post-meal consumption of Hajmola amongst the youth. The campaign is designed by Vritti Imedia, the creator of innovative rural marketing ideas. Since the targeted market was rural, the event was carried out by Vritti Imedia, the leading outdoor advertising in india in small towns. College students of colleges was the target segment. It was the name given to the program which was focused on creating happy moments for the teenage students. Since the product is digestive drops, nothing could be more apt than the college canteen to run the event. The highlight was the Chatkara Expression. During the event, students were supposed to bring Chatkara Expressions on their faces. They were encouraged to be as innovative and funny as possible. The whole activity was video recorded. A montage was prepared after editing to run across the social media. The Wheel of Fortune game was played in the canteen and the winners got the chance to click selfie with the life-size cutout of the brand ambassador. They also got gift coupons worth Rs 10,20 and 50 to use in the canteen for buying eatables. The youth enthusiastically welcomed the event. It got an overwhelming support which was beyond the expectation. The pilot project was conducted at Sharda University of Greater Noida where 15000 students are enrolled. In the first two days, the campaign could reach 8000+ students. It was one of the best programs run by branding agencies in Mumbai. It was an event conducted with short-term and long-term objectives. The short-term objective was, obviously to add cues for instant action at the point of activation to boost the sales. The long-term objective was to carry the core communication of the brand. Due to the systematic planning and flawless execution, the Hajmola activity created a significant impact. The brand which is already well-known in India got reestablished in the minds of youth. Indeed, the activity by Vritti Imedia, one of the leading outdoor advertising agencies inculcated the habit of consuming Hajmola to correct minor digestive disorders and keeping the digestion system healthy. When you drive a car or ride around town, hundreds and thousands of advertisements catch your eyes. Some are so much influential and effective that they get registered in your memory whereas some dont. Billboards, interior and exterior of public transport, railways, taxis and other commercial vehicles, bridges, and buildings; everywhere you see signage and posters. All these are examples of outdoor advertising. Outdoor advertising is when you market the products and services or your brand by publicizing it in outdoors. It is a specialized area and to achieve big benefits you need to hire one of the best outdoor advertising agencies like Vrittiimedia. Since outdoor advertise strikes to your eyes for a short time, it is very important that the advertisement is catchy and bright. Also, it has to be informative and engaging enough. Outdoor advertising has traversed a long way in the past few decades. Gone are the days when wall painting was the only choice available to the outdoor advertising companies. The painting quality was also very primitive, and the work was carried out by local painters. However, these advertisements used to get a big response because it was the only visual medium available. You can still see the use of wall painting in the rural and urban areas but with a great improvement in the content quality and presentation. The secret of the enormous success of wall painting is its cost-effectiveness and reach. As the printing technology took a giant leap in the past four decades, the face of outdoor advertising has changed completely. With the development in the printing technology, it was possible to print huge signboards and billboards. Thus, it eliminated the need to paint it manually. It opened unlimited creative possibilities to outdoor advertising agencies in Mumbai and made the things pretty interesting. The cost was higher initially but with the time it has become quite affordable. 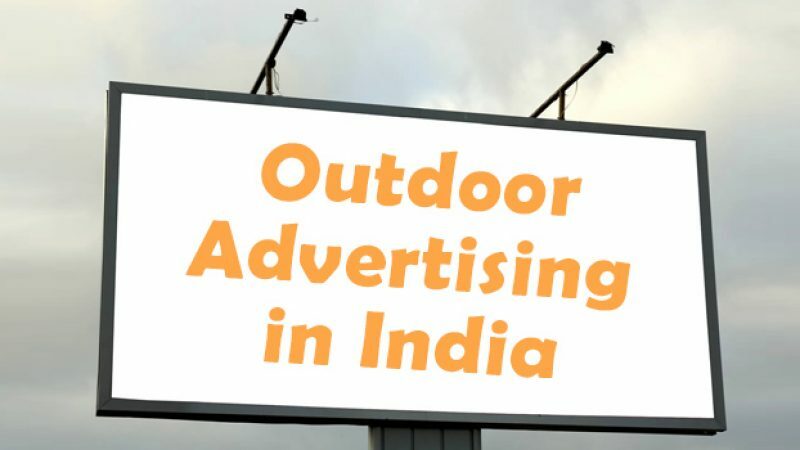 Yes, with the further technological development outdoor advertising in india goes digital. Today we see digital billboards that display products, services, and brands in interactive and engaging ways. Digital billboards are easy to use, dynamic, and cost-effective. The content can be changed as and when required and it is possible to add audio-visual effects also. The future of outdoor advertising seems to be very exciting. Not only for the advertising agencies but for the clients as well!